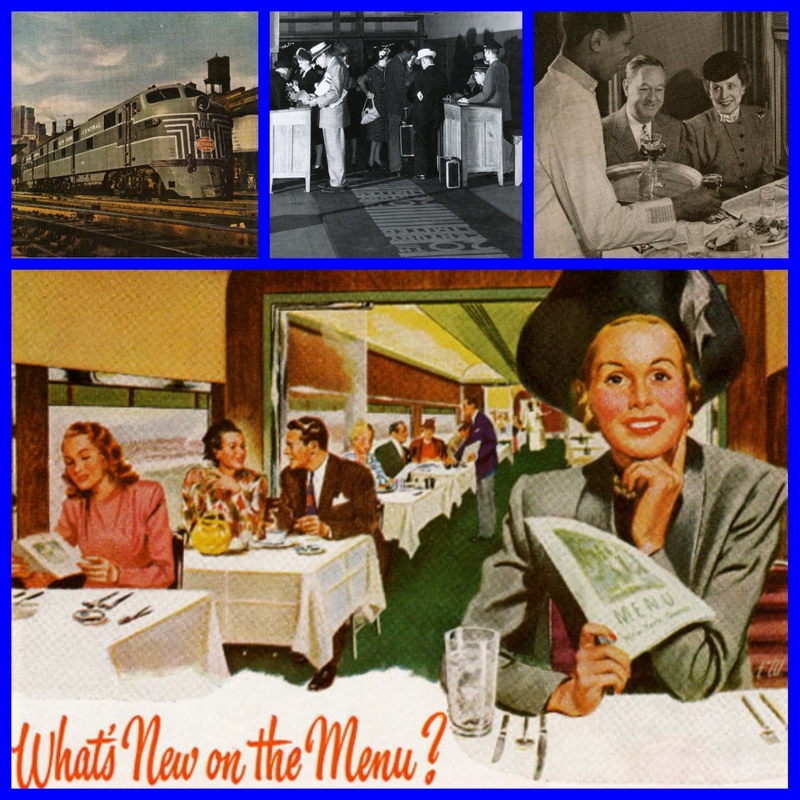 Home / 1940s / New York’s 20th CENTURY LIMITED – the greatest train in the world! Have you wondered where the much-overused phrase “the red carpet treatment” originated? It all started with the 20th Century Limited. The train of tycoons and movie stars. The “Century” was an express all-Pullman passenger train operated by the New York Central nightly from New York to Chicago. 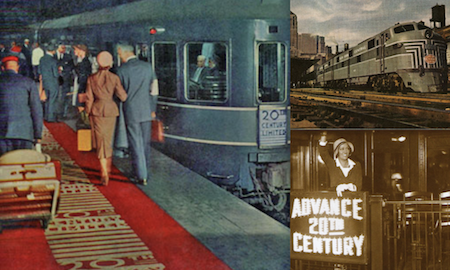 From 1938 until the last run in 1968, passengers walked down a crimson carpet to their waiting cars. This was only done for the departure from New York. Stretching from the observation car to the engine – the football field length rug was specially designed for the Century – thus, the “red carpet treatment” was born. I never saw the red carpet, as my only ride aboard the 20th Century Limited was in late summer 1963, going from Chicago to New York. I was going to school in England and instead of flying I’d traveled by the Super Chief to Chicago and then would sail out of New York on Swedish America Line’s Kungsholm. The 20th was the connection still offering a high quality of service and it was on time! Travel time was less than sixteen hours each way between the two cities during its streamlined years. The train had through cars to Los Angeles and San Francisco. If leaving from New York, you departed at 6 p.m. and arrived the next morning in Chicago at 8:45 a.m. 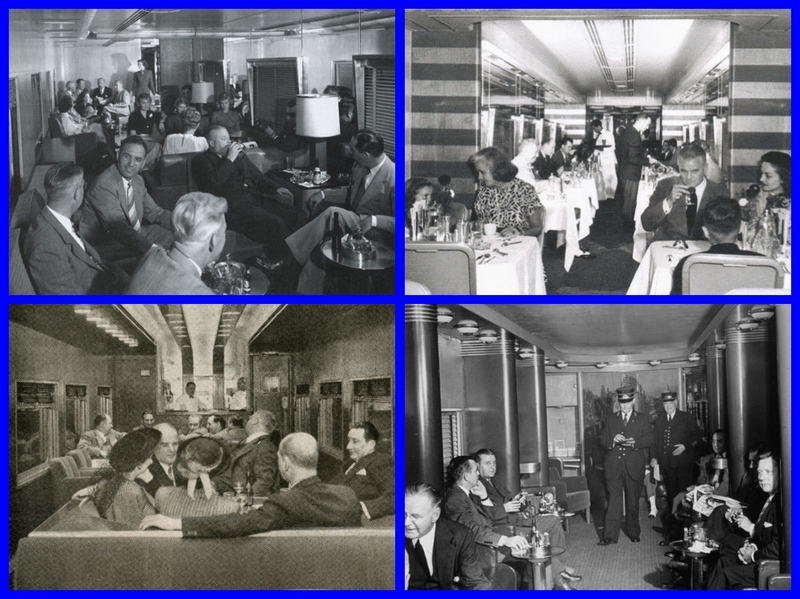 Settling in for the evening, after boarding the Century in downtown Manhattan, you enjoyed cocktails in the observation car, dinner with views of the Hudson, a good night sleep and then with breakfast in bed or in the dining car. Dress was business formal with no room for baseball caps. 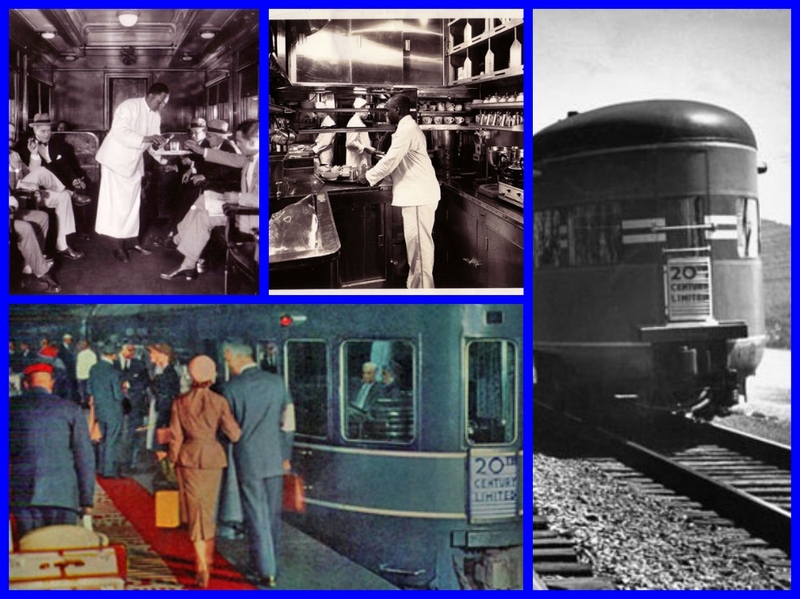 Standing in line for security, enduring a long cab ride or enduring hours on the tarmac because of bad weather were not included in your first class Pullman fare. 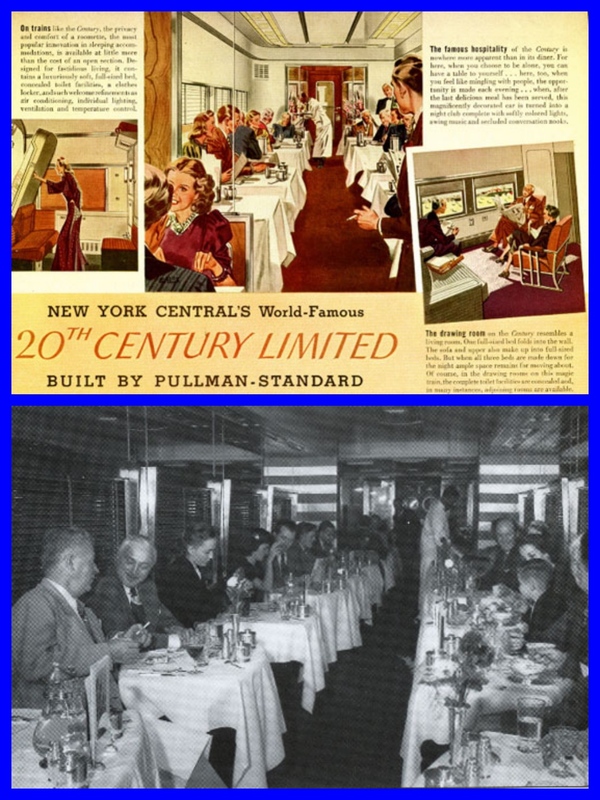 The glamorous departure aboard New York Central’s 20th Century Limited was equal to a sailing on the Queen Mary, Liberte or United States. This was still the only way to “cross the pond” from New York to Europe into the 1950s and Pullman was the only way to travel overnight by train in America. The gateway to the Century’s platform was peopled with passenger agents, Pullman conductors and NYC conductors. Porters helped passengers to board, waiters stood at attention in the dining car with chefs busily preparing dinner. Menus included caviar, filet mignon and lobster. Bartenders in the three club cars took orders for Manhattans, Scotch highballs and very dry Martinis. The train’s crew estimated that 50 per cent of the cocktails sold were consumed in private rooms and suites. Known as the “train of tycoons,” the Century was similar to a commuter train for elite Chicagoans heading for Manhattan. Household names encompassing meatpacking to department stores – such as Robert R. McCormick, Sewell Avery, Marshall Field, Julius Rosenwald, Philip Armour, and Walter Chrysler, Sr. – were mainstays. The dining room stewards had notebooks filled with their particular meal and drink requests. One of them claimed he knew 75 percent of the passengers and could call 15,000 people by their name. He knew that Marshall Field would order one martini but expected to find two in the shaker, Bing Crosby liked his wheat cakes piping hot at 6 a.m. and Robert R. McCormick wanted apple pie a la mode. Passenger lists were maintained for each “sailing” of the Century. Bob Hope, Bette Davis or Doris Day might be aboard. But the Century was really the train for Chicago’s elite. The Wrigleys, Blairs, Bards, and Fields were “the Century regulars” and occupied the bedroom suites, compartments, and drawing rooms. 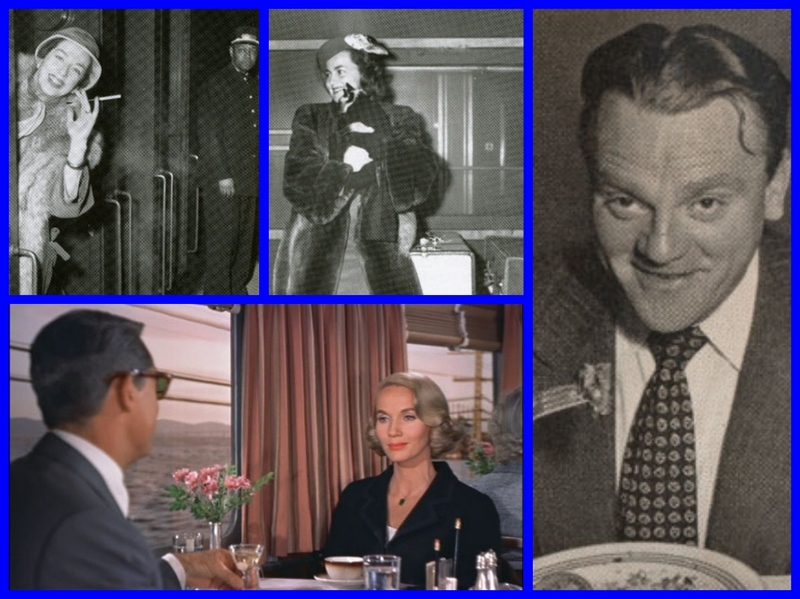 The 20th Century Limited was a repository of the comings and goings – of the rich, tycoons and stars – their habits of dress or drinking, their minds, and their manners. Train Magazine’s great video on the 20th Century Limited. 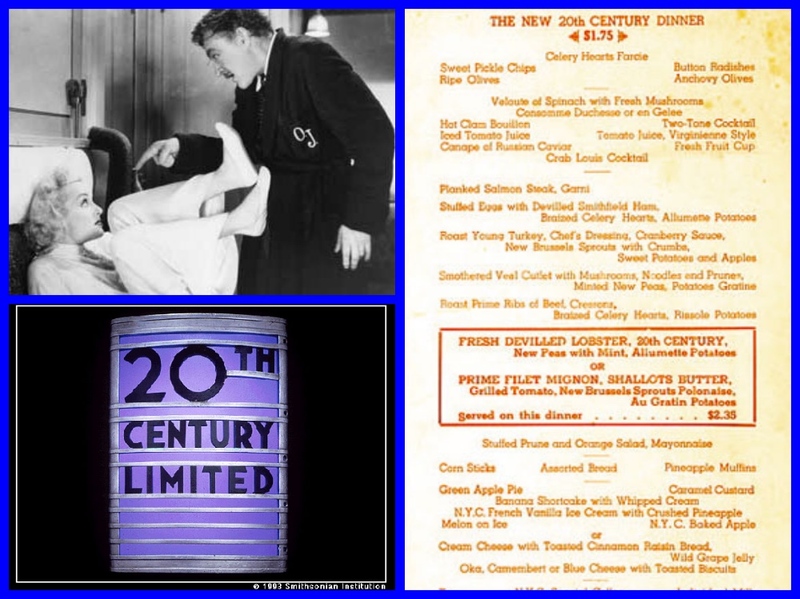 The Century was operated like a private club and the lengthy dining car aptly named the Century Club. To businessmen, the Century was a symbol of the immutable fulfillment of a scheduled pattern; to luxury travelers, it was the last word in conservative opulence. Debuting 1902 as the New York Central’s luxury train, the Century operated overnight between New York and Chicago. The streamliner lasted until the late 1960s and traveled west on the “water level route” alongside the Hudson River and the shores of Lake Erie. 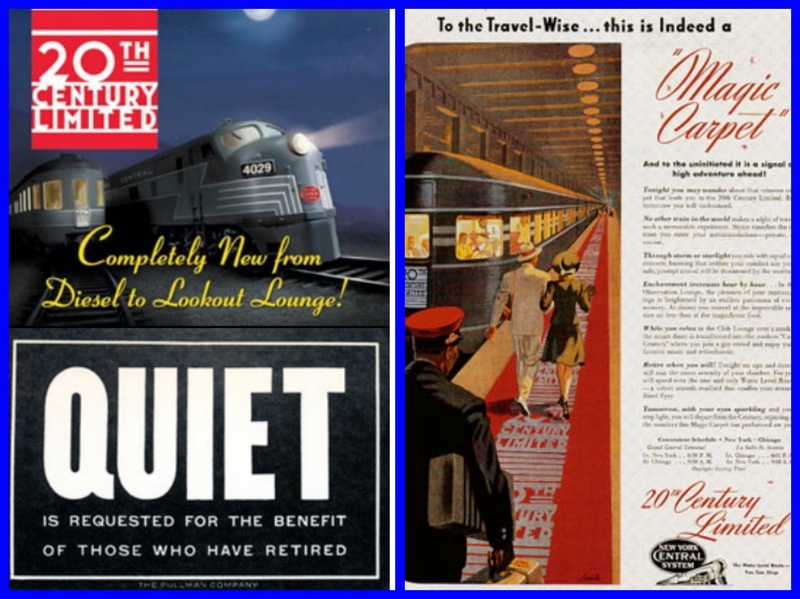 Century advertisements made much of the good night’s sleep passengers would have in their private Pullman rooms on the overnight. This contrasted with the steep mountain climbing passengers experienced on such rival roads as the Pennsylvania Railroad. The Penn’s Broadway Limited was the Century’s chief Chicago bound competitor. Both trains wanted carriage trade traffic. They spent thousands of advertising dollars annually going after the rich, celebrities and high-end business travelers. The trains were in a race to be the tops. For a long time, the Century won out. 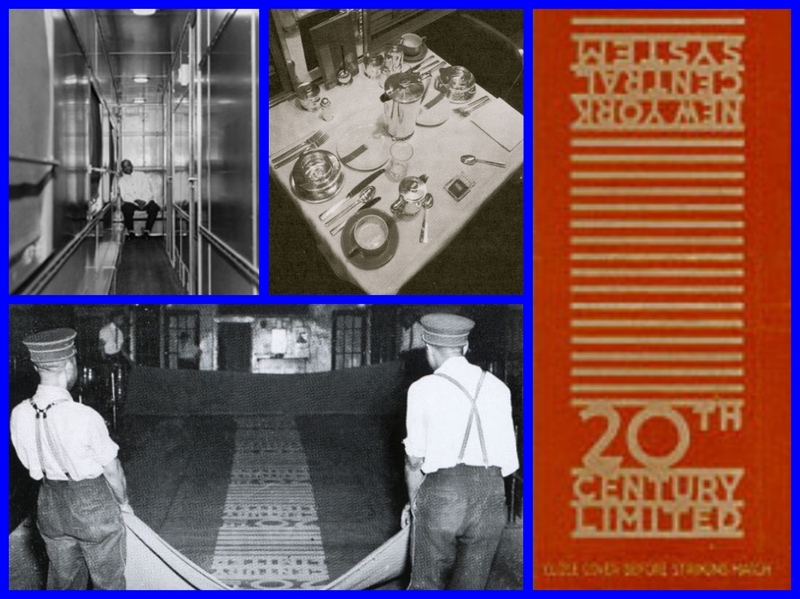 Passengers services included carnations for the men, perfume for women, and complimentary morning newspapers delivered to your rooms (from the Chicago Tribune to the NY Herald-Tribune – the New York Times was not on the list). Train secretaries, manicurists, barbers, gourmet dining and meal service in your private Pullman accommodations was de rigueur. In 1928, its peak year, it earned revenues of $10 million and was believed to be the most profitable train in the world. Also in 1928, Erwin “Cannon Ball” Baker, who eventually became the first commissioner of NASCAR, raced the 20th Century Limited from New York to Chicago in an automobile, beating the train. In 1938 industrial designer Henry Dreyfuss was commissioned by the New York Central to design the streamlined train sets in Art Deco style, with the locomotive and passenger cars rendered in blues and grays (the colors of the New York Central). The streamlined sets were inaugurated on June 15, 1938. His design was probably the most famous American passenger train of all time. 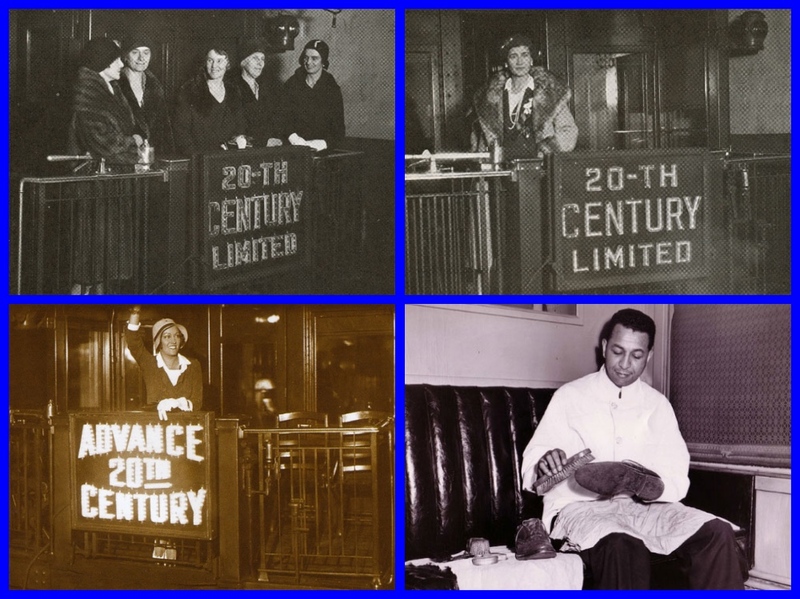 The Century was also the setting for a Broadway musical entitled On the Twentieth Century, based on the 1932 Ben Hecht-Charles MacArthur stage play Twentieth Century, adapted as a film with Carole Lombard and John Barrymore in the lead roles. The train also figured prominently as a setting for major scenes in both Alfred Hitchcock’s North by Northwest and the Band Wagon starring Fred Astaire showing the through sleeping cars connecting with the Santa Fe Chief for Los Angeles. The train has been the subject of many books with Lucius Beebe’s 20th Century being one of the best. But by the late 1950s, the train was in decline. Business travelers were taking the new jets and the Pullman Company was losing money. The Century added coaches, slumber coaches (cheaper sleeping accommodations) and was no longer extra fare. Soon the Century lost its quality passengers to the Broadway Limited, which remained an all-Pullman train into the 1960s. The Century made its final run on December 2, 1967. The half-filled train left Grand Central Terminal on track 34 for the last time. As always, carnations were given to men boarding the train, and perfume and flowers to the women. The next day, it struggled into LaSalle Street Station in Chicago 9 hours 50 minutes late due to a freight derailment near Conneaut, Ohio, necessitating a detour over the Nickel Plate (New York, Chicago, and St. Louis) Railroad. Next: PRIVATE TRAIN CARS: A look inside!